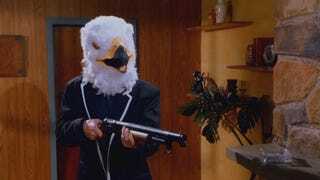 Break out the sit-down gun, Danger 5 is getting a second series! According to Twitch Film, and Dinosaur Worldwide's Facebook page, production on a second series of Danger 5 is due to start later this year... possibly beginning with a Christmas Special? It's Christmas in the 1980s. Adolf Hitler is alive and has two Yuletide wishes: Danger 5 dead... and the world under his Christmas tree. I'm not sure how I feel about the show making the time jump from the pseudo-60's to the pseudo-80's, since the perpetually drinking/smoking and Thunderbirds-style special effects were so completely and utterly perfect, but the age of big hair, epic shoulder pads, sunglasses, and blazing gun battles where nobody ever gets shot, does have its own stylistic vibe.